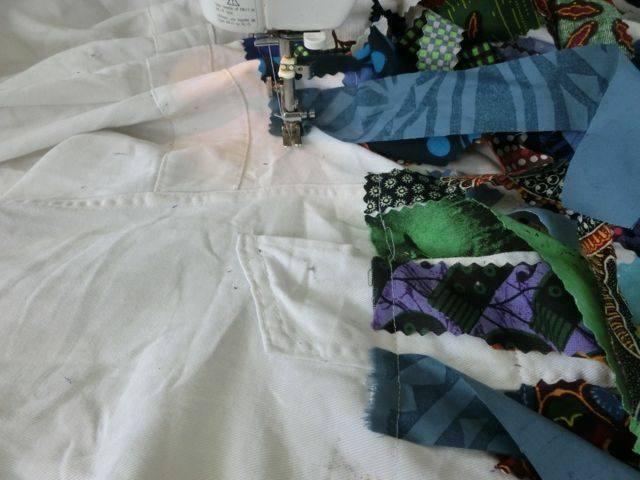 Todays project makes good use of strips and scraps of fabric but it isn't 'string piecing' or 'quilt as you go', or foundation piecing. 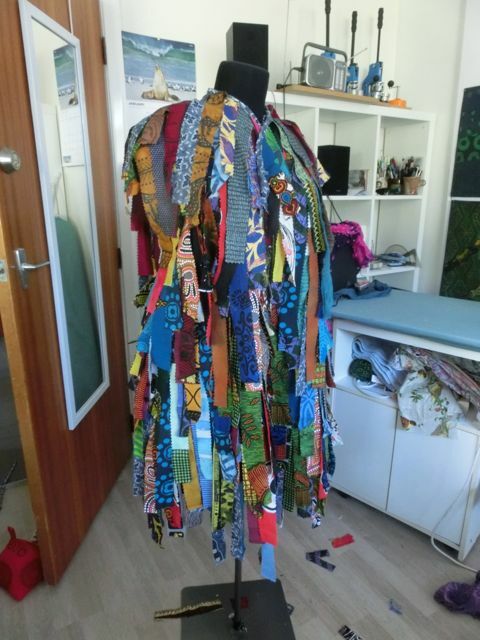 Instead I have used up all those strips and small pieces to make Morris Dancing tatters. Tatters are part of the costume for Morris dancers who dance Border Morris. The strips of fabric are attached to a coat or shirt. I have used an old and tatty lab coat with the sleeves removed. The aim is to use enough fabric to cover the white background but not so much that it gets too heavy and hot to move around in. NB. Thankyou Chyfly for your comment, see below. For some reason I haven't been able to answer your comment but if you ever find any photos or information about the Barge tatters coats I would be very interested in seeing them. I have tried googling it but nothing so far. 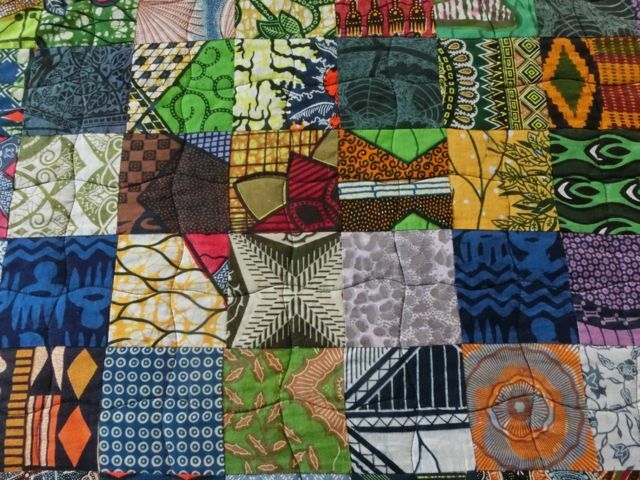 There is a lot of African Fabric on this set of tatters. 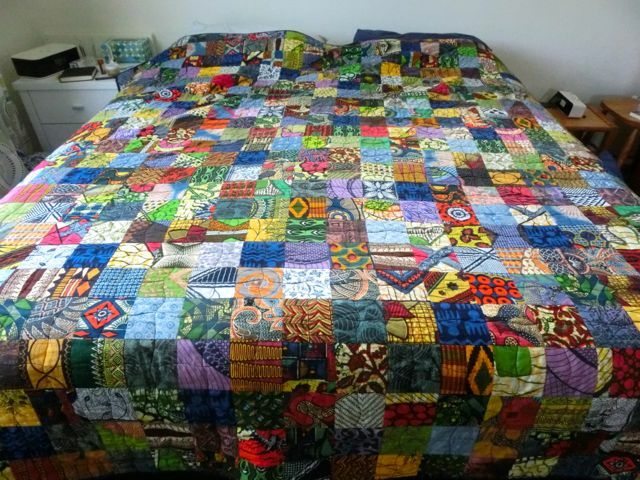 It's left over from an African fabric quilt I made about 7 years ago for our bed. There is also poly cotton fabric from Samoa where I was Artist-in-Residence at an art workshop in 2014, there is left-over quilting fabric and bits of old kimono. 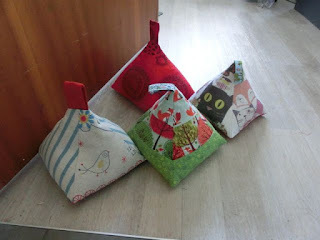 Each piece of fabric has its own story and I'm the only one who knows it - a bit like a scrap- quilt really. The fabrics on this quilt are a mixture of fabrics collected when I taught at a Quilt Festival in South Africa, scavenged from clothing which we wore back in the 1970's when we lived in Kenya, and fabric bought here or donated by an African friend who lives in Auckland. 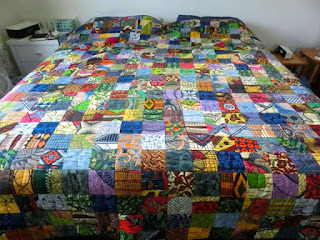 This quilt has been on our bed for quite a few years now and the fabrics are starting to fade. In the detail shot there is one splotchy fabric which has really changed color. Considering the high UV levels in New Zealand, it is not looking too bad. At the end of the day yesterday I had completed 4 doorstops as examples for my beginners sewing - doorstop class. I think I like the green and the photo transfer one the best. My next job is to make a fabric covered book as a sample for the Visual Diary book-making class. Back in the mid 1080's I helped my english cousin make something similar ,the fabric strips not as long and we used an old jacket.They owned an old narrow barge,and traditionally this was often done to old clothing for warmth and to extend its usage. Photo Transfers, commissions and door stops!